The CFNU is working hard to ensure nurses are included in all federal PTSD and occupational stress injury legislation and policies. Manitoba research revealed 1/4 nurses suffer from PTSD symptoms resulting from workplace trauma. Nurses are four times more likely to suffer from PTSD than the rest of the population. 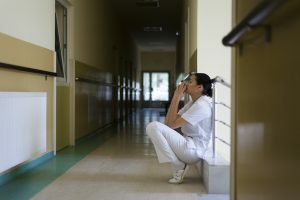 For almost two years, the CFNU has lobbied members of parliament, senators and ministers, demanding that nurses be included in the federal bill C-211, An Act to establish a federal framework on post-traumatic stress disorder (PTSD). With high rates of workplace-related PTSD among nurses, the CFNU’s top priority was to ensure nurses were not forgotten in this legislation. Our efforts paid off with a small victory in June, when the Senate Committee on National Security issued a recommendation to the Health Minister to include nurses in the implementation of Bill C-211. The legislation was finally adopted in June 2018. Equipped with the Senate recommendation, the CFNU will ensure that nurses are duly considered within any federal framework on PTSD.